Parents should make purchasing decisions personally. Conscious stores help them. - Dago s.r.o. What do clients often expect from P.O.S. solutions? This year´s trip to Düsseldorf for inspiration showed possibilities how stores can become a pleasant part of customer´s leisure time. Emotional ties are crucial to excel in oversaturated retail environment. We offer you 10 tips how your points-of-sale can work better for the benefit of you and your customers. Parents should make purchasing decisions personally. Conscious stores help them. POP communication focused on children brings many opportunities as well as ethical dilemmas. Stores and brands are starting to realize this. Children are ideal recipients of advertising messages for marketers in many aspects. They are affected by them more than adults, their decisions are not based on rationality so much and we only have to attract their attention. The commercial communication towards children still has some rules and ethical aspects, particularly in the POP communication. For example American researches by the Institute of Medicine showed that the current excessive exposure of children to advertising is an important factor in the growth of children´s obesity and its spreading epidemic. More than half of the US marketing expenditures focused on children are intended to promote fast-food restaurants, carbonated drinks, sweets and breakfast cereals. The ethical aspects of marketing in this context often appear in its ability to form a children´s diet. “We know that 90 % of decisions related to food for households are influenced by children,” said Tom Warshawski, children’s obesitologist. Nevertheless, we can´t brand the “children´s marketing” as being bad as such. It gets rid of bad connotations especially when it promotes goods beneficial for children. Points-of-sales are places where children begin to influence purchasing decisions first. Children themselves have an increasing purchasing power, which is not recommended to underestimate. But their impact is noticeable much earlier. Parents involve their children into purchasing decision-making process in increasingly young age, giving marketers great opportunities. Children go shopping with their parents often sitting on shopping carts, so they can concentrate on surroundings. Promotional media represent orientation points for them, which may very quickly get their attention and also lose it very quickly. Parents often listen to them and fulfil their wishes. There are related phenomena called “pester power” and “guilt money”, which also support the significant role of children for today´s traders. “Pester power” is a pejorative name for children´s behavior persuading their parents to buy some product. “Guilt money” is a term used to name a situation when parents get redemption fulfilling wishes of their children. For example because they do not have enough time for their children or they do not care enough about them, during the shopping for instance. Especially divorced parents who do not have a child in their care often succumb to this “buying indulgences”. However, the degree of influencing purchasing decisions by children surely depends primarily on their parents. Children are not necessarily just little emperors who need only to point at what they are just interested in. It is always individual. A child is not entirely independent creating an opinion based on his/her own experience, but he/she naturally learns from his/her family and largely relies on it when deciding. Children often rely on their parents and therefore they like mainly what their parents like. When defending their purchase decisions, they also take over the rationalization they see in their family. This is even more common than trying to influence parents to buy something using defiance or making scenes. Surprisingly, for example a discount notification can attract attention of children. Then they defend with their parents that they should buy something because it is cheap or at a favorable price. So here is also an opportunity for parents to explain to their children that they buy something because it is healthy. This gives them opportunity to teach their children that this is the relevant decision-making factor they will also start using gradually. Even if a child is being attracted by something unhealthy, a parent usually has an opportunity to divert his/her attention to some more appropriate product. Large retail chains facilitate it to them more and more by including for example gluten-free or lactose-free food to their assortment or also so called “healthier titbits”. For example Lidl stores in the Czech Republic display also raw bars together with chewing gums an sweets by cash-desks. Just the environment around cash-desks is the place of the most impulsive purchases and also a place where it is the most demanding to defend against child´s wishes. In particular, a child sitting on a shopping cart with eyes fixed directly to displayed products when bored waiting in a queue. From this perspective, we can appreciate TESCO and Lidl chains in the UK. Also, due to the above mentioned reasons, you can´t find any sweets within their cash-desk areas. Both of these companies come to this step after carrying out a survey among their customers. 65 % of the Tesco customers wanted to remove sweets, while in Lidl 7 of 10 respondents wanted to remove sweets. 1 of 6 parents, in the case of Lidl, even stated that they use to buy sweets by cash-desks as a reward for good behavior during shopping. Avoidance of this habit was one of the reasons why the chain decided to do so according to the Lidl management. “We know that it can be difficult to say no to the “pester power”. Removing sweets and chocolates away from cash-desks may make it easier for parents to reward their children in a healthier way,” said Ronny Gottschlich, the former General Director of Lidl Great Britain, in the 2014. 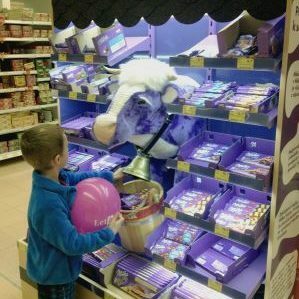 Many supply companies also deal with the ethical aspect of the in-store communication in relation to children. For example company Nestlé internally restricts some of its resources itself. “Nestlé puts emphasis on the ethics of child-directed marketing. In the case of children aged 6 to 12, there can be conducted only communication related to products meeting parameters of the European Pledge and related rules of Nestlé for communication towards children. That is why, for example in stores when promoting Granko, we do not aim at children under the age of 6, for children under the age of 12, we do not communication biscuits, chocolate and confectionery,” explains Jakub Hort, the Brand Manager of Nestlé for Granko and Caro brands. Many other producers of food and beverages, including the companies Mondeléz, Coca-Cola, Pepsico, Ferrero, Intersnack or Danone, are also signed under the initiative of EU Pledge. A highly impulsive behavior is characteristic for children. Their purchasing decisions are formed or changed at points-of-sales, when they move through aisles and see products with their own eyes. They do not filter advertising messages like adults. Children are overwhelmed by stimuli affecting them at points-of-sales much more than influencing adults. The phase of distraction and passion is then critical. Visiting a store may remind children of a tour to fairy-tale Willy Wonka Chocolate Factory. The extent of their interest is high, but their attention can quickly shift from one thing to another. The ideal form of in-store communication focused on children is dependent primarily on their age. The basic principles for an effective execution of in-store promotions that will attract shoppers are “big, colorful and simple”. From these, especially simplicity is the key to success. Children between 3 – 10 years of age are inquisitive, they like to discover and look for fun. According to the study by Millward Brown, they respond to simple, funny and playful communication involving their imagination. Marketing communication is most effective when it contains some melody, cartoon pictures and humor. But it must be adequate to their age and cognitive abilities, otherwise children would not understand it. Children tend to personify objects and they have an affinity for cartoon characters. A character they known well considerably stands out from the surrounding crowded chaotic environment. Researches also showed that in advertisements using child actors, they should be approximately two years older than the target group. In general, children like a bright environment. But this does not provide a comfort experience for them just by itself. Smaller children have a problem with orientation within a space, so it is useful to provide navigation elements on floors. Goods and advertising messages intended for children should be at the level of their eyes and at their arm´s length. The possibility to touch goods is not only for the reason to put it into a shopping cart. Children appreciate multisensory experiences and so also interesting and interactive packaging they could touch. Today´s toy shops adapts to this trend as they do not resemble any longer places where parents had to ask shop assistants behind a counter for a particular toy to take it into hands. 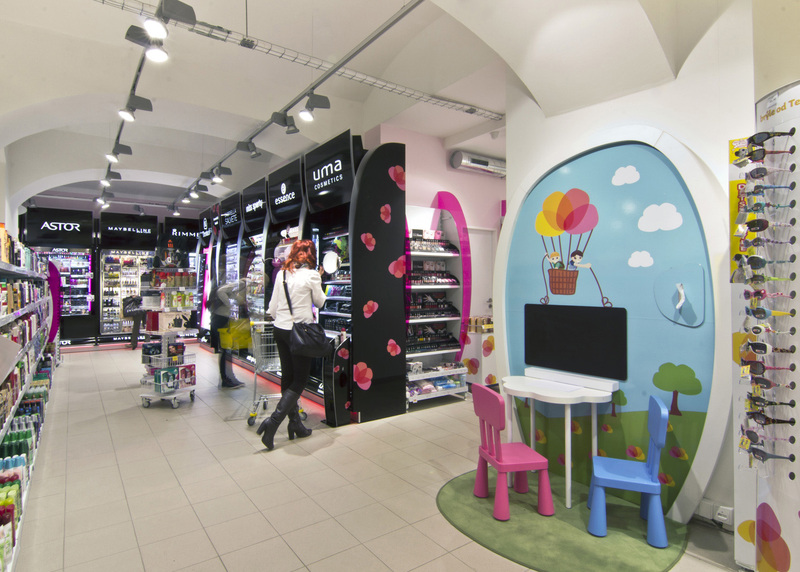 For example Bambule toy-shop offers children´s nook in many shopping centers throughout the Czech Republic equipped with its goods, where parents can leave their children in the care of trained staff while they do their other shopping. The digital revolution and familiarity of children with touch screens bring new opportunities to interactivity and involvement of modern technologies into the store environment. This is not necessarily about pubescents, also today´s pre-school children have own digital expectations. The IKEA furniture chain is also aware of this as it has special digital panels in its stores also its small visitors can enjoy. Also in Teta drugstore, they focus on pleasant moments for children in a store, even though they are not a primary target group of the drugstore chain. Their target group includes women of productive age. Still, when redesigning the stores, there were considered also their offspring. “We were thinking of a shopper we called Alena. We imagined her day when she runs up with her children to Teta drugstore, one child on her arm, heavy bag in the other hand and she has no time… It is a classic pre-prepared purchase, for example nappies and Sunar, she is stressed and doesn´t enjoy it at all,” said representatives of the brand a year ago at the conference Multichannel & Data & Trendy. That is why Teta drugstore, within the redesign of its stores, created also children´s nooks for mothers to leave their children there while shopping. As a result, their average purchase volume has significantly increased. Its competitor, DM drugstore, for a change considers children being their future customers. Thanks to its preventive program Happy teeth, it explains them how to brush their teeth properly at its specialized events in shopping centers as well as directly at primary schools. These mentioned examples show that the marketing focused on children doesn´t need to have elements of unethical manipulation. The promoted categories can be considered to be the main problem rather than marketing procedures. Few parents would be angry with a child for wanting another LEGO kit. If the promotion of “unhealthy” goods will decrease and there will increase promotion of goods beneficial for children, the reputation of “children´s marketing” will improve.